I’m not talking about planning an all day hike, nor suggesting a hike that takes significant planning. And I’m certainly not suggesting you do what I did a few weeks ago and set off on a 40 mile trek on the Appalachian Trail in the Blue Ridge Mountains of Virginia. A trek that included total elevation changes of 8,650 feet over steep rocky terrain while keeping an eye out for sunning Timber Rattlesnakes, and then before darkness fell, hanging food bags high enough between trees to make things tough for hiker-savvy black bears. “Why am I doing this?” I experienced that feeling momentarily on day two, but I trekked on, for I am hopelessly addicted to outdoor adventure. If you are looking for an easy autumn meander right here in Oakland County, on a wide trail with almost no elevation changes, a trail that’s spiced with the colors, sounds and scents of nature’s way, and sign post location maps at almost every trail junction, then today’s “Wilder Side of Oakland County” is for you. You might even want to bring your camera, a friend or two, or the family. Orion Oaks County Park was my destination last Sunday morning, our first frosty morning in northern Oakland County. That’s all solid information, but it makes no mention of what the park is like during these golden days of October, nor why it’s a great place for an easy hike. So here’s my take on why Orion Oaks gets my nod for an easy autumn meander, starting with the fact it’s an easy park to find, and the trailheads are adjacent to the parking lots. I started my trek just after sunrise entering from the parking lot on the south side of Clarkston Road (Orion Township) between Baldwin Road and Joslyn Road. Hikers always need to practice situational awareness no matter where they trek, and should take note that bow hunting is permitted at many parks and state wildlands within our county, Orion Oaks among them. If you hike at dawn or dusk during hunting season, stay on the trails. During my morning meander, I trekked all of the 3.6 mile Bluebird Loop, part of the 2.13 mile Massasauga Loop and a section of the 1.84 mile Orion Thru-way trail. All of the trails at Orion Oaks are grass or hard packed dirt, and are interconnected. 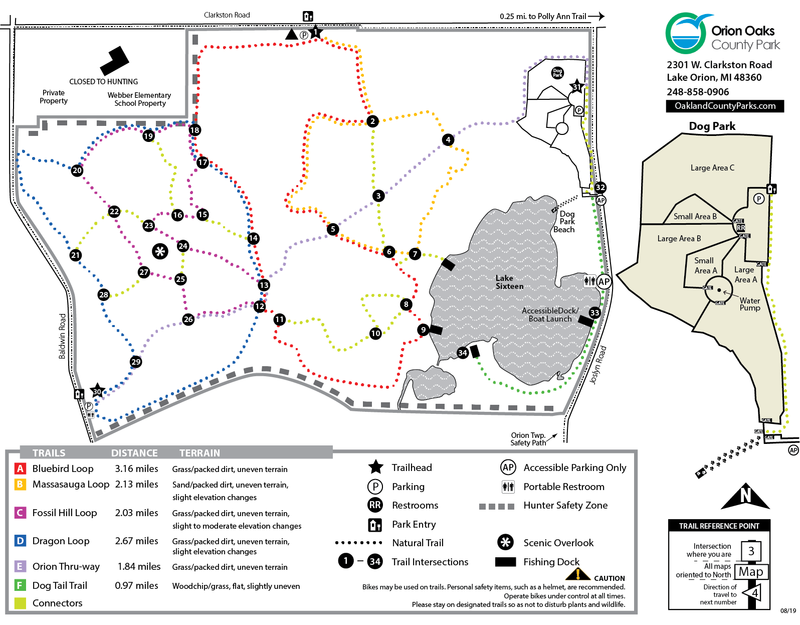 None of the trails are challenging and most have very gentle slopes with the exception of part of the Fossil Hill Loop that has a bit of hill, described as “slight to moderate elevation changes.” There were no maps available at the Clarkston trailhead, so plan ahead and print one for yourself: Orion Oaks Trail Map. A cascade of falling leaves greeted me as soon as I entered the woods, and from there things just got better with the rich scents of autumn adding to the adventure as I meandered along, feeling a bit guilty at sending a trio of wild turkeys into flight. Forty-five minutes of slow paced nature-embracing walking led me to the dock on the west side of Lake Sixteen. The frost covered bench on the dock was the perfect perch to watch the sun climb higher, illuminating the lake as morning fog seemingly melted away to accompanying bird song. I admired the dock’s trailside interpretive sign describing the “Best Damn Builders in the County” – a reference to beavers, but the only splashes I heard were from ducks coming in for water landings. From there it was off to the open meadows that lure bluebirds in the spring, monarchs in summer and hikers year round. It’s now glistening with acres of milkweed pods almost as far as the eye could see. Some of the silky floss was covered with frost, while others sparkled in morning dew. The presence of the milkweed’s silky filaments in such abundance reminded me of historical notes about the plant’s significance in World War Two. As war raged on, the supplies of kapok fiber were cut off and our military turned to the floss of milkweed as a suitable substitute for stuffing life jackets and insulation for air crew flight suits. Historical records estimate that 11 million pounds of milkweed floss was gathered during the war for those purposes. The final few minutes of my hike in this very tame section of the Wilder Side of Oakland County took me under a sassafras tree dressed in its brilliant reddish orange leaves, and then just as I reached my car, a flight of Sandhill Cranes began their descent, perhaps to the meadow of milkweeds for a rest stop before winging south. The easy meander at Orion Oaks was the perfect way to start the day without any worries about travel, weather, huffing and puffing up steep inclines or bears. Give it a try! You may just find that hiking becomes contagious. For more news and events, visit our website and follow along with us on Facebook, Twitter, LinkedIn, Instagram, Pinterest, and YouTube using #OaklandCounty.